Flexagons are fascinating manipulative toys made from folded strips of paper which, when flexed, change shape and pattern in remarkable ways. The simplest type of flexagons are the tetraflexagons. Flexagons and Flexigation provides a good introduction to making, flexing and mapping some basic members of this family and shows how they can be used as the basis of puzzles and magical effects. The most complex and fascinating flexagons to explore and flex are the silverflexagons, which are made from strips divided into right angle isosceles triangles. You can find detailed instructions showing how to make, flex and explore many of the best of these in my book Silverflexagons and the Flexatube which can be purchased from the Water Trade shop or from any good online retailer. An extract from this book analysing the Woven Flexatube can be found below. I have also written The Magic of Flexagons for Tarquin publications. 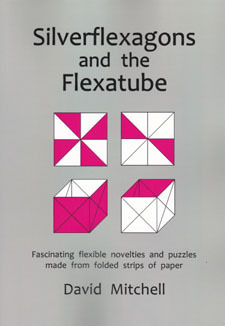 This is a more general cut-out-and-glue-together book, which provides an excellent introduction to a wide range of interesting flexagons and the Flexatube.